I found myself in downtown Orlando, with a little bit of time to kill. I decided to re-visit Lake Eola. My challenge to myself was to capture different images than previous visits to the park. The sun was just disappearing behind the skyscrapers. I know that these are simple images, but they are some of my favorite! were getting in their evening swim. the lake turned to gold. those are lovely captures. the first shot of the swan is magical. Happy Scenic Sunday! Magical, stunning, beautiful, exquisite, the list could go on until I run out of words. You have absolutely captivated my heart with these pictures!!! What do you mean simple images??? These are stunning! That swan is a beauty and what amazing color in that sunset! I truly enjoyed looking at these tonight! You made one error in your typing...you said, "The sun was disappointing behind the building..." I think you meant "disappearing." 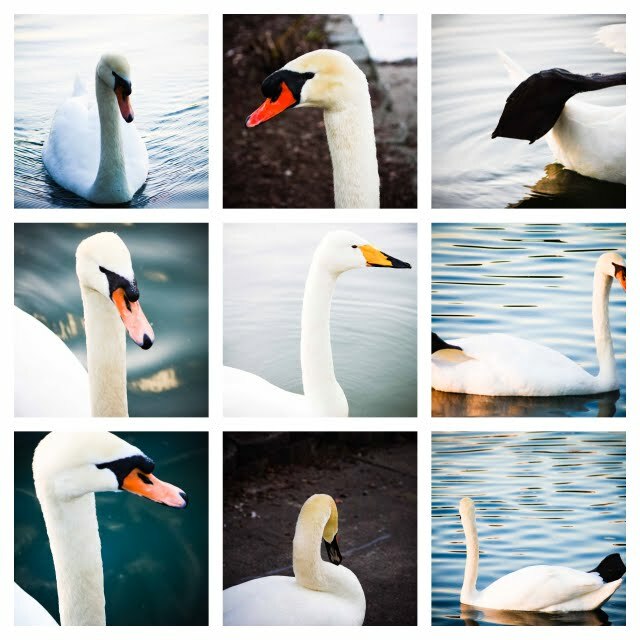 Carly, What lovely photos...and the Swan at the end of the post is absolutely stunning! Loved it all! Happy Blue Monday! What lovely captures of the moments. And wonderful for MYM. Oh wow, these are lovely. I love the sunset shots. Lovely, lovely series, the fourth is my favorite! Simplicity is often the best. A beautiful series, and the monochrome works nicely. Lovely photos, Carly! The Golden colors and swans are beautiful. Good job, Carly. Happy Blue Monday. Beautiful pictures. I just love the swans...your photos captured their grace and beauty. Such lovely pictures and a wonderful mosaic! Thank you for sharing all of this beauty! I hope that you have a wonderful new week. Beautiful sight!! Love them! Happy Monday! Beautiful photos! Happy Blue Monday.